Puppies. Kittens. Human babies. Some creatures get all the cute credit. When you think of sea life, you probably think of slimy, scaly creatures lurking at the bottom of a lake or the ocean. And you’re right—they are slimy and scaly! But they can be pretty darn cute, too. Don’t believe us? Check out these nine critters that will instantly make your aquarium cuter. Oh, you’ve never heard of Axolotl, a type of salamander that looks like an adorable anime character who can regenerate entire limbs and enjoys eating beef? Axolotls are native to Xochimilcho Lake in Mexico, where they’re considered endangered species. Because they can regenerate limbs, however, they’re bred extensively in captivity and used for research. If you add Axolotls to your aquarium, you’ll need a lot of space—and a couple of years. They can grow anywhere from six to 18 inches long, and can live for a whopping 20 years. It looks like this goldfish just got this bad news, but is reacting adorably: Despite his protruding eyeballs, he (and his telescope goldfish brethren) actually have very poor vision. Plus, their eyes are especially susceptible to injury and infection. Human men, take note … and thank your lucky stars you weren’t born a seahorse. During mating, the female seahorse lays dozens—even up to hundreds—of eggs inside a male seahorse’s abdomen. The male then carries the eggs in his brood pouch (a pouch designed specifically to carry young, not wallets) until they’re born about 45 days later. When they’re born, baby seahorses are about the size of a jellybean (CUTE!) and avoid predators by clinging together in small groups (ADORABLE AND A LITTLE SAD!). Sea-monkeys are probably the most disappointing thing you’ve ever ordered from a catalog … unless you’ve also tried ordering a money tree or Mexican jumping beans. They just don’t work! Neither a wise investment, nor primates, nor sea creatures, sea-monkeys are a type of brine shrimp that thrive in salt lakes and salt flats. So, where’d they get their name? Harold von Braunhut started selling sea-monkeys in the 1960s, initially calling them “Instant Life.” Then, in 1964, they were marketed as sea-monkeys due to their aquatic environment (duh) and monkey-like tails. An octopus may look a little like the evil villain from a sci-fi movie, but someone has to love the bad guys, too, right? Make that evil geniuses, actually. Octopuses are among a small group of animals that have been observed using tools—specifically, gathering discarded coconut shells and using them as protective housing. What’s more? If an octopus isn’t stimulated by its environment—meaning, it gets too bored—it’ll get stressed out. Some octopuses get so bored, they're driven to eat their own limbs. If you keep an octopus, be sure to decorate its tank with some shells and flowerpots. No one should be bored enough to eat their own arms. 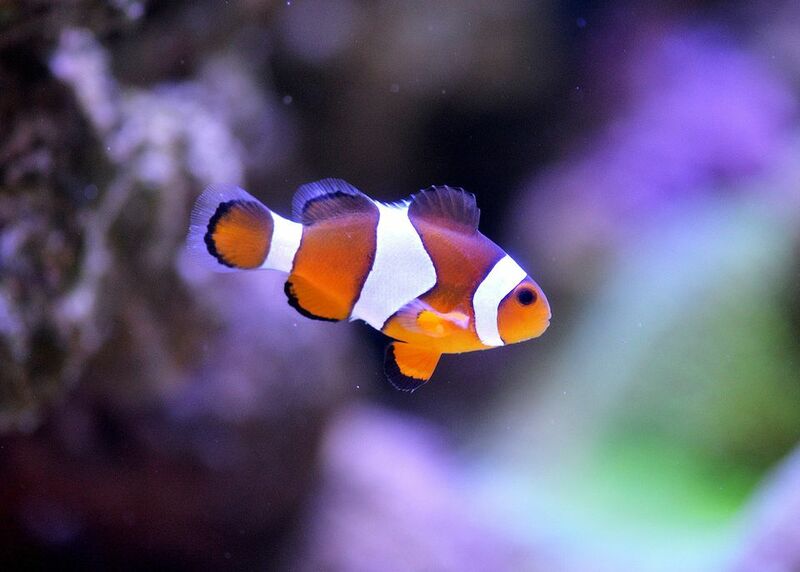 Cute faces and that wildly popular movie aren’t the clownfish’s only claims to fame—they’re brilliant badasses, too. Clownfish live among anemones, creatures whose tentacles release a toxin when a predator or prey comes in contact. But clownfish develop an immunity to the toxin by slowly and carefully touching the tentacles to different parts of their bodies. Eventually, a protective layer of mucus forms on the clownfish’s body. Then, the pair develops a symbiotic relationship. The clownfish attracts prey to the anemone and the anemone protects the clownfish. Genius. Forget, for a second, that a single pufferfish contains enough toxin—called tetrodotoxin—that can kill 30 adult men at once. It’s actually up to 1,200 times stronger than cyanide. Forgotten? Pufferfish have kind of cute, doofy faces, right? Snails aren’t just tasty, Parisian eats. They can make slimy, yet oddly endearing, additions to your aquarium … that have developed some seriously sci-fi breathing mechanisms. While some aquatic snails breathe through gills, others use a lung that floats to the surface every time they need a gulp of air. Others still have a breathing tube that can stretch to the water’s surface. Every third grade class had a kid who was super into his hermit crab. Maybe it was you. Either way, that kid (you) was right: Hermit crabs are actually pretty cute—as long as you don’t see ‘em naked and shell-less. They're also super interesting. Did you know hermit crabs live in huge, organized colonies and interact with each other? Some of those interactions include fighting each other for the most primo shells.